As the quote by Canadian food writer and cookbook author Gail Simmons goes, “There is no better way to bring people together than with desserts”. In Malaysia, the cafe-hopping craze has been a rising trend in the recent years, with tonnes of unique cafes mushrooming to appease the demands of cafe-goers who live to taste exquisite desserts complemented with premium coffee drinks. In a way, visiting cafes has evolved to become a way of life, an avenue where people can get together and socialise. With that, Sevenfriday Space by Red Army Watches is taking it a few steps further with their innovative menu. Presenting the uniquely Malaysian Cendol Latte and the intriguing Dirty Latte, Sevenfriday Space shows their dedication to consistently craft new and time-exclusive drinks because people are naturally attracted to unique experiences. On top of these, Burnt Cheesecake with Sorbet will also be served to complement the coffee drinks. Cendol Latte is a rich concoction of coffee, ‘Gula Melaka’, and fragrant pandan jelly noodles (‘cendol’), dipped gently with the nostalgic red bean ‘aiskrim potong’, all forming layers and layers of Malaysian flavours in the glass waiting to be stirred and united as one. If latte was Malaysian, this would be it. 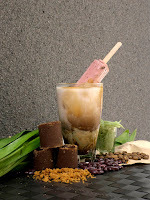 There are also traces of espresso that counters the sweetness of the ‘Gula Melaka’, preventing it from overpowering the remaining flavours of the drink. Dirty Latte is a result of mixing cold milk with espresso to create the dirty drink look that forms on top of the glass. This drink is served without a spoon to encourage customers to fully enjoy the different flavours that come with each sip. Burnt Cheesecake with Sorbet is an innovative culinary take on the popular classic dessert. 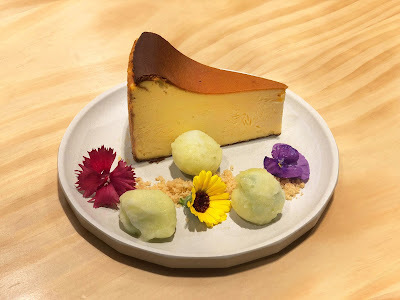 The cake contains hypnotising and rich cheese flavour with perfectly caramelised edges, served with a scoop of whipped feijoa and pear sorbet. Known for their specialty coffee sourced from numerous famous roasters around the world, namely Simple Kaffa, Padre and Fuglen, Sevenfriday Space also stays true to their Malaysian roots by curating from local roasters like Artisan Roast, Seraph Awaken and also Supernormal Coffee Roasters. As such, customers can expect quality hand brewed coffee with just the perfect amount of flavour while letting their taste buds to truly “travel the world”. Coffee lovers can even choose from a list of single-origin coffees or even award-winning roasts, boasting a wide range of selection. The coffee beans, including the roaster ones, are also available for purchase, for personal indulgence or even as a thoughtful gift. 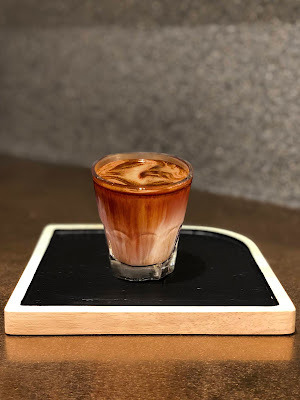 Catering to the casual coffee sippers, the menu also extends to the more common drinks such as espresso-based coffee, hot and iced chocolate, matcha latte, and even juices. The Head Barista of Sevenfriday Space, Kevin Justin Chai, will be overseeing the preparation of these new drinks and dessert in addition to their normal classic drinks like Americano, latte, cappuccino and all items on their menu. Armed with eight years of experience, he has travelled to Europe and Taiwan, believing that part of a Barista’s mission is to pass down their experience and passion to customers through their crafted drinks. It is evident that from the rationale behind the Space, including the food and drinks, down to their passionate team, Sevenfriday ultimately offers their touch of lifestyle to complete customers’ experience in a place where people can look forward to enjoy food, socialise and even work. Furthermore, as a luxury accessory brand itself, the Space allows visitors to appreciate, explore and learn more about Sevenfriday’s range of industry-themed timepieces, accessories, sunglasses and more, within their space spanning over 750 sqft and located on Level 2 of Robinsons at Four Seasons Place Kuala Lumpur. Essentially, with the help of a wide selection of desserts and artisanal coffees, the Space highlights an experience where family, friends and watch lovers can come together and understand what it is like to live everyday like Sevenfriday. “Sevenfriday Space is the first in Malaysia to offer a watch lounge concept store that combines watch retail with an intimate coffee bar, all meticulously furnished to achieve the brand’s signature industrial chic mood. Our retail accessories also complement lifestyle seamlessly as they are meant for everyday use, and their designs encourage us to notice the littlest beautiful things surrounding us, and that is what happiness is all about,” Julianna added. As a lifestyle brand, Sevenfriday has been making industrial inspired watches since 2012, and it was in 2016 that they wanted a new challenge which led to the introduction of their guitars, the G-Series. In 2017, bracelets were added onto the brand’s portfolio as a new way for their customers to express their personal lifestyle. Within the coming months, Sevenfriday Space will be hosting even more exciting events for friends and families. For more information and to keep up to date with their events, visit their Facebook page at https://www.facebook.com/sevenfridayspacekualalumpur/.